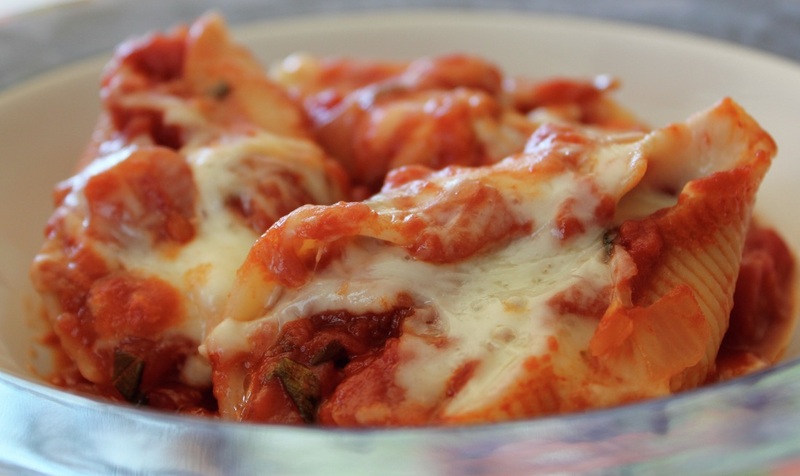 This recipe uses the spinach mixture and the tomato sauce from the spinach lasagna but instead of layering them with lasagna noodles, you stuff pre-cooked giant pasta shells. Cool and drain the water from the spinach completely. Boil 18 giant pasta shells in a large pot following directions on box. Cook until al dente. In a medium bowl, combine ricotta cheese, egg, Parmesan cheese, garlic powder, and spinach. Mix well to blend. In the bottom of a 12x 8 baking dish spread 1 cup tomato sauce. Stuff each pasta shell with 1/18 (about 1 tablespoon) of the spinach mix. Top all stuffed shells with tomato sauce. Top with grated mozzarella cheese. Cover and bake in a 375 degree oven for 35 minutes. In a medium saucepan over medium high heat saute onions and garlic in oil until golden brown. Add tomato paste. Stir 2-3 min. Add water, wine, crushed tomatoes, and basil leaves. Bring the sauce to a boil. Lower heat to low and simmer stirring occasionally for at least 20 min.